OSC launch coach to Nottingham! TICKETS: The Go Goodwin’s Manchester Storm welcome the Cardiff Devils on Saturday the 2nd December here at Planet Ice Altrincham! Tickets can be ordered online, by calling the box office on 0161 926 8782, or in person at the box office. 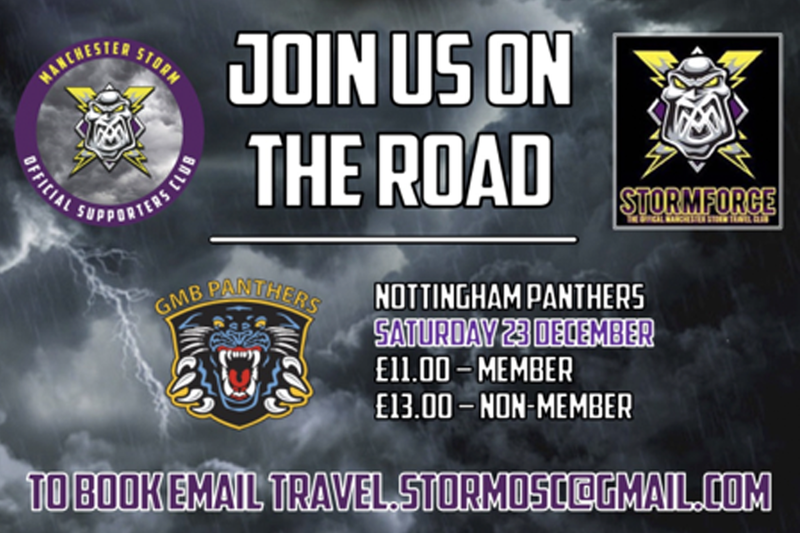 We are pleased to announce our next coach will be to the Nottingham Panthers on Saturday 23RD December! Tickets are priced at £11.00 for members and £13.00 for non-members! Why not save yourself hassle and expense of driving and parking in Nottingham … join #StormForce1 … sit back and relax and let the OSC handle the rest! And don’t forget as always that one lucky passenger will be walking away with a game used stick! Storm OSC launch Winter Celebration!